1. Short-term focus—great strategy takes time to execute. But in many companies, one missed number sets off a tactical fire drill of reactivity with no regards for the impact on long-term performance. 2. Tactically driven—many sales/account plans I’ve seen list the goals, objectives and tactics. What they don’t tend to identify is the general resource allocation plan, or strategy, to achieve the goals and objectives. If the objectives are not being met, it becomes impossible to set a new course of direction because you never had one in the first place! The business deteriorates into a game of tactical roulette. 3. Flawed performance evaluation—it’s popular to force rank sales people/account managers/regions against one another within the same company. It’s also moronic. Are you really telling me that the context of the business in New York City, central Iowa and southern California is exactly the same? Of course it’s not. So how in the world is it reasonable to force rank people on their performances when they may be in dramatically different circumstances? A great account manager in a tough market like Detroit constantly being ranked behind (hence, lower salary raises) a poor account manager in a high performing market like Miami should be unacceptable—except that it’s the norm. How has the market changed in the past six months? Which customers are we choosing to serve, and which customers are we choosing not to serve? Why? How is our strategic approach to the market different than that of our competitors? What factors within the organization are helping and hindering our chances of success? In what areas are customers under-served? Apple provided under-served MP3 customers with a quick, easy, and legal way to download music with the iTunes music store. In what areas are customers over-served? Google made billions of dollars in part because Yahoo over-served customers on their home page with too much clutter. Google gave people a clean white page with one box to enter text and voila! If we created a profile of the most dangerous, fictitious competitor, what would they offer and how would they offer it? Can we employ some of those traits? What are the 3-5 strategic themes I will focus my resources in to play and win? 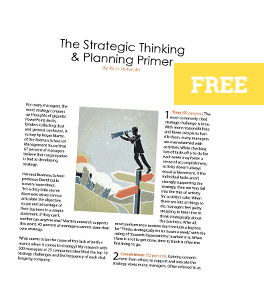 What are the key activities and tactics that support these strategic themes? What activities, initiatives, projects, tactics and reports will I STOP doing in order to better focus my resources?